Extreme Lawn Makeover…Low Water Plants Takeover! 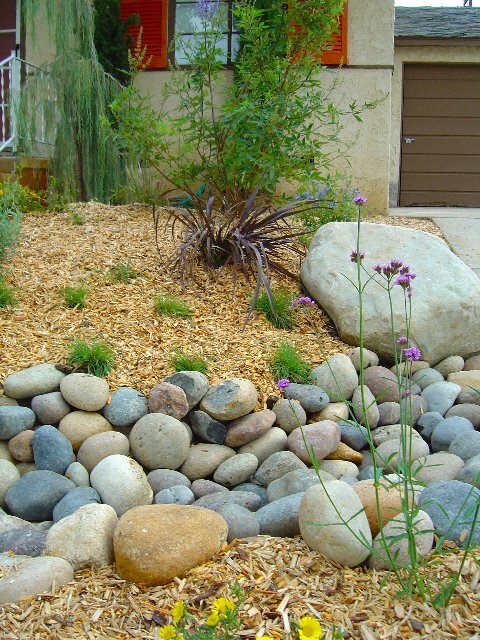 Extreme lawn makeovers, or "xeriscape landscaping" is the use of low water plants to save water in the landscape. Water is a precious commodity these days and in my work as a landscape designer, I'm known for replacing thirsty lawns with colorful low-water gardens. 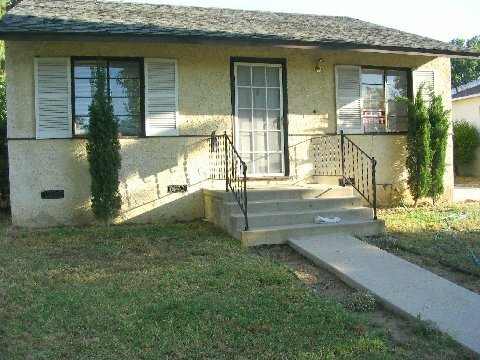 I understand its tough for homeowners to rip out their lawns because once the grass is gone; there is a large space to fill. The decisions can seem daunting, from what plants to use to how to install a new drip irrigation system. 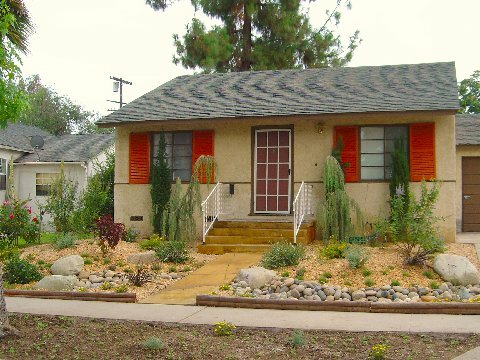 In my show, "Garden Police" on the Discovery Home Channel, my partner, Michael Glassman and I performed an "extreme lawn makeover" on a tiny front yard and replaced it with a xeriscape garden that became a model for the wise use of water in their neighborhood. I hope it will give you some inspiration as well. After- The new low water garden plants attract hummingbirds and butterflies. 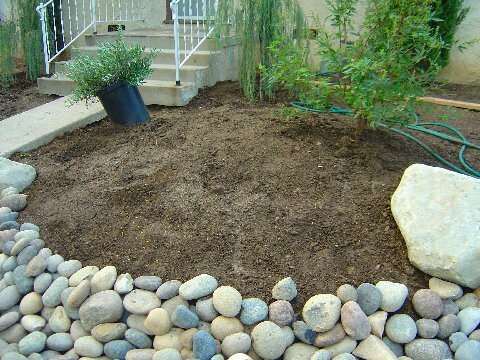 Tall berms and a dry stone river along the bottom helped to" break up" the deep void left after the lawn was taken out. We used a 70/30 soil blend that incorporates 70% topsoil and 30% organic amendments to keep the berm from "deflating" after watering. Medium sized boulders punctuate and accent the gardens. 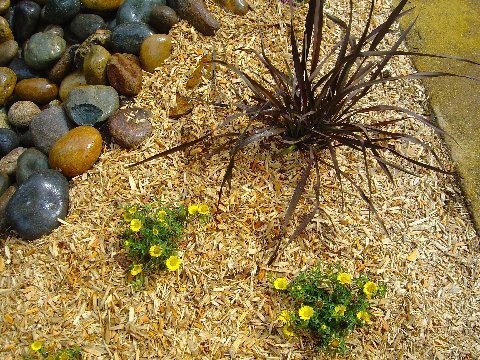 Yellow, "gold coin" groundcover will knit together and contrast with the burgundy Phormium. We used weed cloth underneath the entire garden to insulate the soil and retard weed growth. The plants were selected for bold architectural appearance and contrasting foliage that would keep this garden looking interesting the year round. Clockwise from top, juniper, Tolson's weeping juniper, Cotinus, "Little Olie" (dwarf olive), Vitex and Plumbago. Drip irrigation supplies water to each plant. 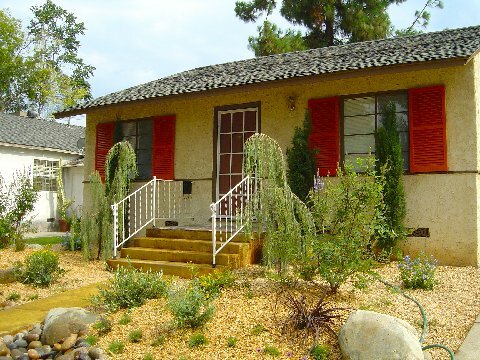 The shutters and door were painted a warm terra cotta. The gray concrete walkway was acid stained a golden sand color for an inexpensive and fast color infusion that compliments the gardens. We top-dressed the garden with 3" of mulch to retard weed growth and preserve soil moisture. Mulch is a finishing detail every garden should have. Ground Covers: Erigonum "Santa Barbara Daisy," Sedum sieboldii. Asteriscus maritimus-"gold coin"
"Xeriscaping Plants: Drought Resistant Plants"
Shirley Bovshow’s Edenmakers’ Blog » Blog Archive » Front Yard Garden Replaces Lawn and Lone Palm Tree! Weeds and leaves can be a problem. This is how I deal with them. I use a weed barrier cloth underneath to help mitigate weed growth. It does cut down weeds at least 80%, because those weeds are stubborn! I use an electrical garden blower to blow the leaves off once a week= works like a charm! If you maintain your walkway or dry river once a week with the rest of the yard, it really is not a huge chore. These elements in the garden age very well and look great for many years. Thanks for asking and for leaving your comment. Ooops. I meant “river rocks”. Looks great! I’ve tried using gravel and river walks in some of my plantings but they just quickly become covered in leaves and weeds. I find having to constantly clean out the gravel to be less fun than other garden chores and often wonder how these gardens look a few months or a few years after installation. Is there a maintenance trick I need to learn? Really nice makeover. With an average 50% of water use on outside irrigation, this is a real opportunity to save water without sacrificing aesthetic beauty. I think the re-paint on the home was a real nice complement to the work you did. Great job! Thanks Jodi for your visit and comment. I agree that it is difficult to transition people off of the extensive use of lawns, but as a designer, I feel compelled to give alternative ideas. 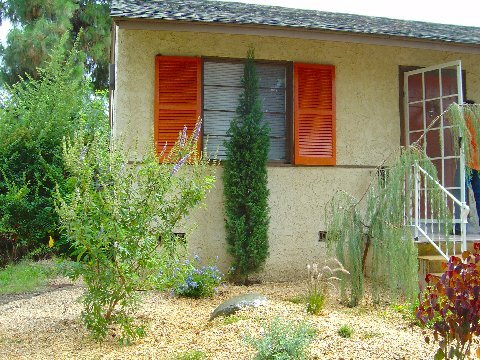 Lawns are “no brainers” and fill a large area quickly without having to make “plant decisions.” It’s exciting to introduce people to lesser known plants and groundcovers and dispell the myth that a water wise garden is bland and boring. An interesting and timely post, indeed. Now, if you could just figure out a way to weanpeople off of water-gluttony with regards to golf courses, that would also be terrific. (I just read the article in the current National Geographic about water shortages in the western US, and saw the striking aerial photo of the golf course in the Mojave desert. Just doesn’t make sense. I enjoyed finding your blog!